No To NATO MINI PEACE FESTIVAL CALLED OFF BY VENUE AFTER POLICE GET INVOLVED!!! 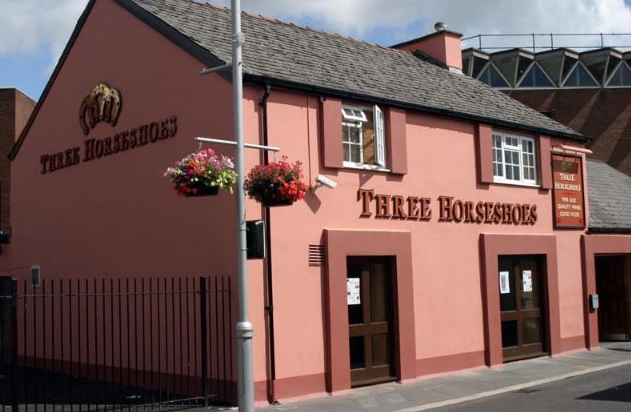 I was gutted to receive a phone call from the manager of the Three Horseshoes to say that the pubs owners had instructed him to cancel the Mini Peace Festival after the Police had contacted them to raise ‘concerns’ over the event. I have not got full details of what was said, but it appears they mentioned my name specifically and may have suggested that that as known political activist they may have to ‘monitor’ the event. This has evidently spooked the pub owners into not wanting to be involved at all. I can only apologise to all the people, and performers in particular, that had so generously committed to supporting the event. The Long March on Newport will still take place, but I cannot see me being able to put on much of a reception for them in Bridgend. Sorry, everybody. (I am still able to offer accommodation to Maggie and Sheila as before). I will post details of how to get involved with the Long March when I get them. This entry was posted in Uncategorized on August 14, 2014 by Bridgend's Green Leftie. SOUTH WALES IS OFFICIALLY A FASCIST STATE. Heddlu de Cymru, South Wales Police, have forced the cancellation of the Mini Peace Festival that was to be held in a Bridgend pub by putting pressure on the pub owners, saying they would have to monitor the event (threatening the pubs licence), because it was being organised by a political activist known to them. The police feel so threatened by the Chair of the local Green Party that they feel they have to pressure local business owners. Does this mean that democracy in south Wales is now dead and that all candidates at elections, have to be approved by the POLICE. Gwent Police and Newport City Council are working WITH the organisers of No NATO Newport to facilitate many thousands of protestors at the NATO summit, because peaceful protest is the lawful right of every citizen. Gwent Police even know and accept that there will be many cases of direct action taking place. The Mini Peace Festival isn’t even a protest, yet South Wales Police feel they have to pressurise the owner of the venue. WHAT ARE SOUTH WALES POLICE AFRAID OF? Is it that one of the performers may sing a protest song and a riot may break out? Or perhaps that this event is so big it will rival Woodstock. Do they perhaps fear that this event will radicalise the people of Bridgend? I call on South Wales Police to re-think. Assure the owner of the venue that there is no threat from them to his livelihood or licence, obviously accepting normal licensing conditions. I’ll be boycotting the Three Horseshoes pub forever for cancelling a peace festival. Outrageous behaviour by South Wales Police. I think that Natalie Bennett and Caroline Lucas should raise awareness of this. It was supposed to be a PEACE festival. Should we call it a WAR festival instead, would that be OK? John Evans is right, should the police be in charge of who stands in elections?